The Guthrie-Smith Trust was founded in 1942 after Barbara Absolom, daughter of Herbert Guthrie-Smith, donated 800 hectares of land to it to administer for the benefit of the people of New Zealand educational and recreational purposes. In 1997, the Trustees sold the majority of the land and retained 80 hectares and buildings, purchasing a further 10 hectares in 2007. 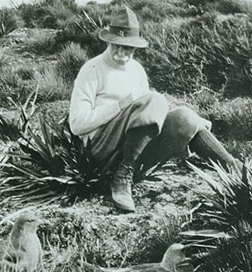 Today, the Trust Board is continuing Herbert Guthrie-Smith’s vision by transforming the land into an ecologically-important haven for a wide section of native birds and a repository of rare and endangered trees, plants, and other flora. • To preserve and protect the historical heritage of the land and buildings. The Guthrie-Smith Board of Trustees is responsible for the governance and strategic direction of the charitable Trust’s activities. They are a group of local, well respected and successful individuals who each possess a passion for ecology and education.